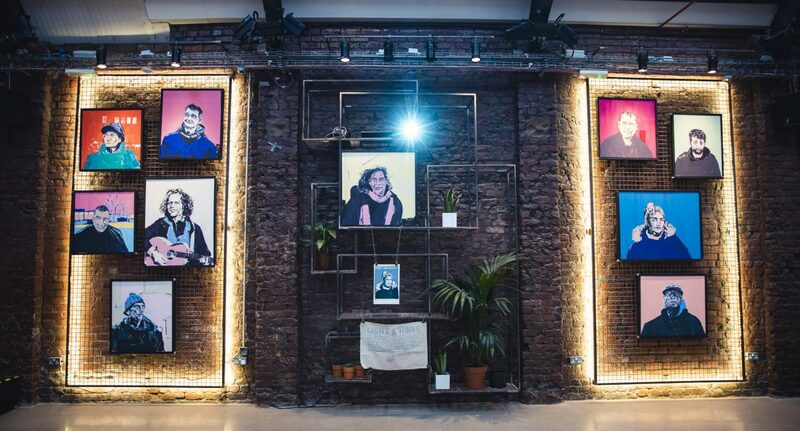 The Light & Noise exhibition at The Yard was the first stop of a European tour which aims to shine a light on homelessness, and how we can change the perceptions surrounding the problem. Born out of a fantastic collaboration between barber, Joshua Coombes, TOMS, and Centrepoint Manchester, the event displayed a collection of art by Mark Perry Young, IMPATV, and Jamie Morrison. The works ranged from striking portraits of the homeless on colour block backgrounds, to minimalist paintings of city scenery, to a video installation depicting passersby from the perspective of the street floor. When combined, the exhibition was a powerful insight into life on the streets, and all profits from sales go directly to Centrepoint Manchester. I speak with Joshua Coombes, the brains behind the #dosomethingfornothing campaign. He tells me that three years ago he decided he wanted to make a change in his community, so he went out and gave haircuts to the homeless. Several months later, he quit his job as a hairdresser to fully commit himself to supporting the homeless community. Coombes underlines the journey he took to this moment. He describes that the decision to take action “came from a feeling of helplessness, [homelessness was] something [he] just saw as a statistic, that [he] didn’t feel [he] could relate to very much.” Coombes describes how he “wanted to find out more about people’s stories” as the process was “about the connection [he] was making” with his homeless ‘clients’. The hashtag-focused campaign, however, is something that often arouses criticism nowadays. I pose this question to Coombes, that social media activism is often considered superficial and not effective in creating change. Coombes’ response was strong; “that’s like saying words and ideas are never going to change the word… social media and hashtags are just tools to communicate.” He went on to describe the beauty of our modern ability to connect through social media, as he is able to see people all over the world participating in his campaign through the hashtag. ‘Light & Noise’ only stopped off in Manchester for one night, however if you happen to be in Paris, Berlin, or Amsterdam in the coming weeks, it’s worth a visit! To get involved in the fight against homelessness in your community, check out the Centrepoint website.